Right Now | Tough or Tendril? Grasping cucumber tendrils coil in two different directions. Close study led to the discovery of a new type of spring. The cucumber tendril has long fascinated observant gardeners. 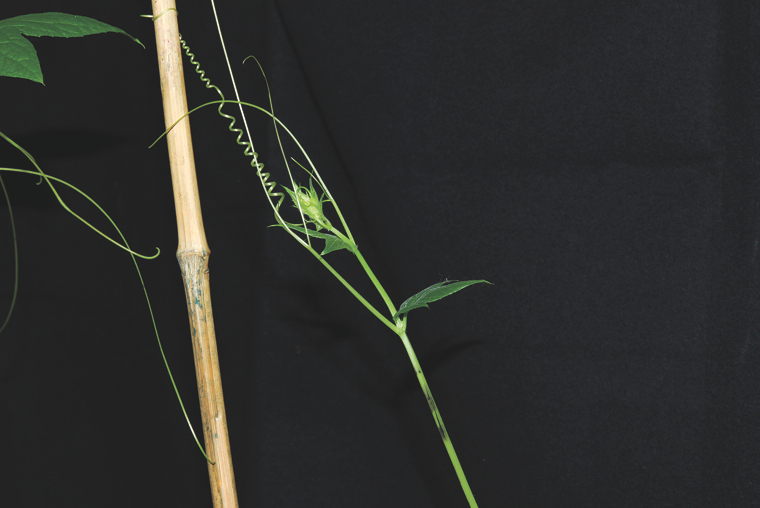 This specialized plant stem grows straight at first—until it reaches the nearest trellis or fence post. Then it changes shape, wrapping around the object, twisting into tiny coils, and gaining a support structure for its efforts to grow toward the sun. These grasping tendrils have also intrigued scientists for centuries; Charles Darwin explored the topic in On the Movements and Habits of Climbing Plants, published in 1865. 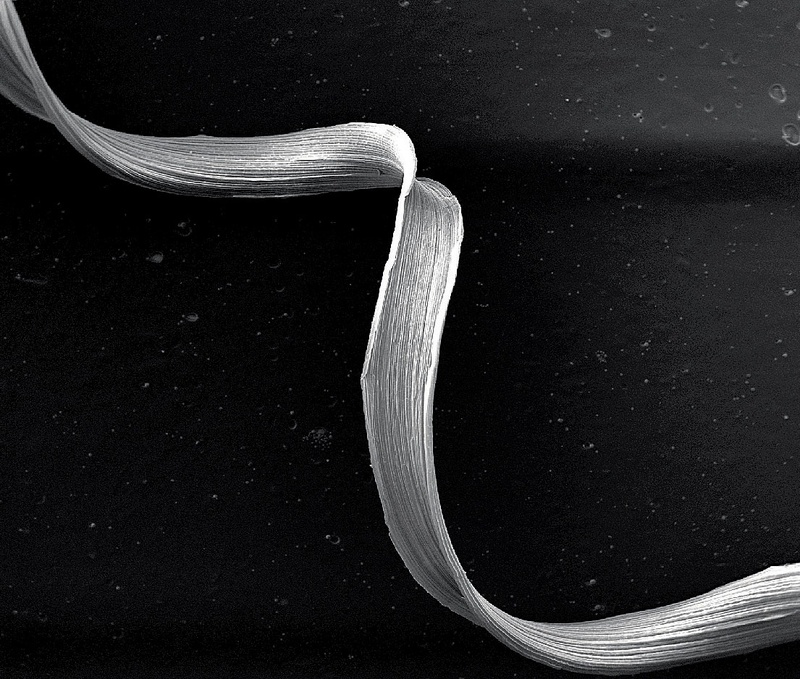 He noted that a coiled cucumber tendril twists in one direction and then the other, with the two sections joined in the middle by a straight piece that he termed the “perversion.” Many scientists have studied cucumber tendrils since then, but important questions remained unanswered: Just how does the tendril curl? And how do these coils benefit the plant? The team began by dissecting the tendril at various points in its development and found a thin ribbon of gelatinous fibers, running the length of the stem, that becomes woody—or “lignifies”—over time. As it ages, this rigid strand also loses water and shrinks, and that combination of lignification and shrinkage pulls the entire tendril into its coiled shape. Once they understood the biological mechanism of the coil, the team wanted to represent it with physical models. “As a scientist, if I understand something, I should be able to recreate it,” Mahadevan explains. Using ordinary materials including rubber, glue, copper wire, and tape, the researchers made numerous tendril models until they arrived at one that behaved like a real cucumber tendril. It allowed them to explore something surprising that they’d noted in live tendrils: when pulled from opposite ends, the coil does not straighten, but first overwinds, adding more turns to both helices before it eventually straightens. The team also developed mathematical models that allowed it to understand the mechanical properties of the coil. Mahadevan points out that Darwin presciently called the cucumber tendril “an excellent spring,” and the Harvard researchers quantified the structure, discovering in the process a new type of spring. With its two opposite-handed helices joined by the straight perversion in the center, the spring responds flexibly to varying levels of force. It’s pliant when pulled gently, and grows stiffer when pulled more forcefully. The stiffer the spring becomes, the more tightly it curls, and the presence of the perversion allows it to freely overwind or underwind. The team’s findings appeared in the journal Science last summer. Mahadevan sees benefits for the cucumber: when a tendril is young and especially tender, and first winding onto a nearby trellis, a weak connection would be helpful. “If the wind blows or there is a disturbance of some other kind, then you don’t want the whole thing to fall apart,” he explains. “You want a relatively soft response.” But as the tendril develops tighter connections to a trellis over time, it grows woodier and reacts more strongly to any pulling, protecting the mature plant.